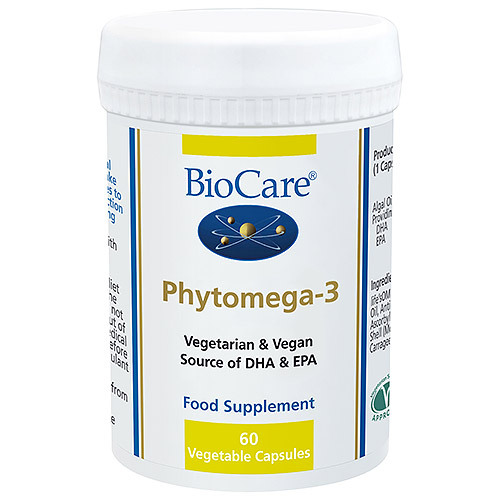 Phytomega-3 is amongst one of the first supplements in the UK to give vegetarians and vegans a direct supply of important EPA & DHA from natural algae. DHA contributes to the maintenance of normal brain function and normal vision. Maternal intake of DHA contributes to the normal brain development of the foetus and breastfed infants. Omega-3 essential fatty acids are vital for health. The body can convert the omega-3 essential fatty acid - alpha linolenic acid (obtained from vegetable sources) - into EPA and DHA but it is not efficient and a small percentage of people may not be able to make this conversion at all. DHA and EPA are essential fatty acids that contribute to many biochemical functions within the body. They are used as building blocks for cell membranes and form the basis of chemical messengers, supporting the function of many body systems such as the cardiovascular, nervous, reproductive and immune systems. Phytomega-3 is high in DHA which is particularly important in foetal development and for normal brain and eye function. Life’s OMEGA­­™ (Algal Oil, High Oleic Sunflower Oil, Antioxidants [Natural Mixed Tocopherols & Ascorbyl Palmitate], Rosemary Extract), Capsule Shell (Modified Corn Starch, Glycerol, Carageenan [Seagel Cap], Sodium Carbonate). One vegicap taken daily with food, or as professionally directed. 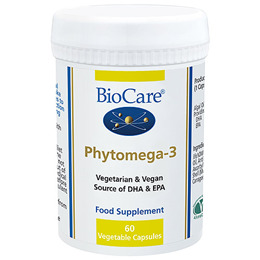 Below are reviews of Phytomega-3 - DHA & EPA - Vegan - 60 Vegicaps by bodykind customers. If you have tried this product we'd love to hear what you think so please leave a review.